Welcome back — your badge was your ticket out…. Gelhaus and an unidentified deputy spotted Lopez walking to a friend’s house carrying what was mistakenly believed to be an AK-47 rifle. The “weapon” was actually a plastic BB gun that fired plastic pellets. It is smaller than the actual rifle and has a transparent plastic middle section. The encounter took place at 3:15 PM on a brightly-lit day, which means that the “weapon” would have been recognized as a toy if Gelhaus would have taken a second or two to get a good look at it. After calling in a report of an armed suspect, Gelhaus ordered the other deputy — a trainee — to pull up about twenty to thirty feet behind the Middle School-age boy. Gelhaus drew his gun, took cover behind a door, and ordered Lopez to “drop the gun.” The youngster, reacting instinctively to an unfamiliar — and unidentified — voice, turned to face the deputies. 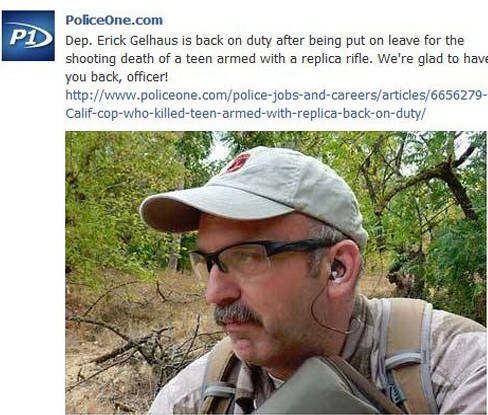 Gelhaus reacted by firing seven shots. All of this took place within the space of about ten seconds. Because he lives at the intersection of panic and paranoia, Gelhaus is primed to kill with very little provocation. Two months before he gunned down Andy Lopez without bothering to find out if the boy actually posed a threat, Gelhaus drew a gun during a traffic stop involving Santa Rosa resident Jeffrey Westbrook. Gelhaus had pulled over Westbrook for failing to use his turn signal. The traffic stop took place on a narrow shoulder near a steep hillside, and Westbrook asked if he could move the car in order to make more room for the officer. Gelhaus reacted by pulling his gun and pointing it at the terrified driver’s head. When Westbrook learned that Gelhaus was the officer who had fatally shot Lopez, he found himself wondering if “maybe something could have been done” to rein in the bellicose deputy before he killed somebody. Gelhaus has been restricted to desk duty until the familiar ritual of exoneration reaches its foreordained conclusion.